Ex-Housemate Vanessa Feltz returned to the House yesterday to take part in a conference task. 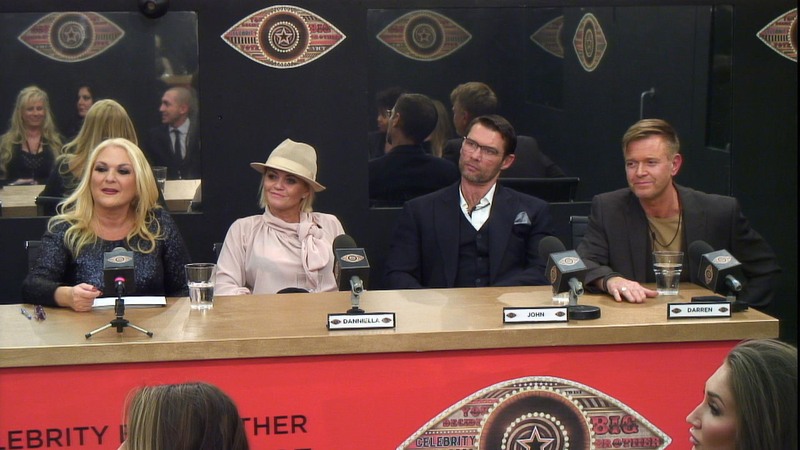 Big Brother reveals to the house that housemates will now take part in a press conference task hosted by Vanessa Feltz in the task room. Also present are ex-housemate Megan and Luisa Zissman, alongside members of the press and Big Brother viewers. John is asked if he thought he did the right thing by nominating Darren, “In retrospect I still think I did the right thing. I was thinking about Darren.” Luisa says it was a ‘nasty’ thing to do. A viewer asks Darren if he thinks he’s boring, “I probably am a bit. I was once labelled the most hated man in Britain. I come in here to try and change the public and media’s perception of me.” Luisa asks if he has a game play, he denies he has. Megan asks Scotty T if it was just a showmance between them, he replies, “It wasn’t fake at all. Our connection was real and I’ll find out what happens when I get out.” Scotty T and Tiffany confirm nothing is going on between them, it’s just flirting. Tiffany says that she hopes the public continue to vote for her. A viewer comments that she’s ‘a cougar 20 years too early’, Tiffany thanks her for a compliment.